If one should be slain by a native of Commorragh, it’s safe to assume that their murderer took devilish pleasure in the act. 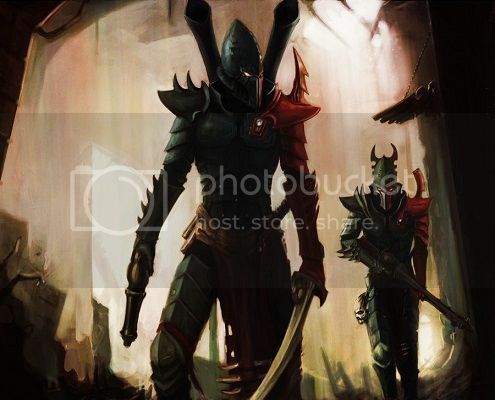 Dark Eldar have an abominable reputation for good reason, a race long stained from millennia after millennia of heinous and unforgivable atrocities. They’ve earned every damning curse uttered onto them, and not once have they felt a shadow of remorse. Even so, an anomaly was seconds away from happening. Zaknyrr, a Dracon of the Kabal of the Cutting Web, was lining up a kill in his blast pistol’s sights, and as unbelievable as it tasted even to himself, it gave him no satisfaction. It wasn’t the fault of the soon to be victim. A creature so desperate that he dropped any rational measure for his chances of escape and was now desperately running for the ‘safety’ of the cover of an alien jungle. Thousands looked on as the man fled from their ranks. They stood as corralled livestock, many stricken with panic, others numb from years of nightmarish imprisonment. They had been brought here for sport. A blood sport for black hearted kings and queens; with no greater purpose than the hunt of sentient creatures. Once caught, they would be butchered as mere animals. It was a gruesome holiday of sorts for the Kabal of the Cutting Web. Their masters had squeezed them densely into a herd of various races of men and women, all the while patrolling Kabal Warriors kept the prisoners contained. Not long before, servants of the Cutting Web had instructed the slaves to remain in their designated area until the nearby carrier ship signaled a discharge chime. There had been no confusion; the message had been delivered in over thirty languages to ensure compliance. Why one man had decided to run prematurely for the jungle was a mystery no one cared enough about to speculate on. Maybe he didn’t trust the Dark Eldar to keep their word about actually cutting their slaves loose. Maybe the glimpse of sunshine, after years of dungeon dwelling, was just too much for his sanity to steady itself against. Whatever his reasons, they had just sealed his fate. His Venom glided over the shoreline and then smoothly turned into an intercepting angle towards his target. They had landed lakeside on Shauth, the same location the Kabal had used for over half a century. It was as ideal a spot as a Death World could reasonably be expected to provide. The shoreline was nice and flat, and the choking jungle gave a rare reprieve and provided a grassy clearing for a few square miles off the lake’s northern lip. Enough space to cram over four thousand slaves and a few of the Kabal’s space craft. Zaknyrr was alone atop the anti-grav cruiser, pistol extended in hand, as he closed in on his target. His aim was true, but his focus was elsewhere. The thought of the kill registered hollow inside him, so hollow in fact, that it was unfamiliar. With hesitation he pulled his weapon down and then holstered his Blast Pistol. He decided that something more than a fatal shot in the back would be required if he was to restore his razor’s edge. The Venom leapt forward as Zaknyrr steered his chariot toward the much too slow prisoner. He took note of the man’s face as the fool dared to peer over his shoulder and glance at the vehicle’s armored blades approaching his exposed back flesh. Even with the pure, unadulterated fear painted across the mortal’s face, the Dracon remained lost from his normal sadistic satisfaction. Zaknyrr sighed to himself and then ran the man through with the venom’s forward blade. Four thousand herded prisoners witnessed the slaughter of one of their own, but not a cry was uttered. None of them so much as flinched at the man's demise. The slaves of the Kabal had been conditioned to such for violence; brutality on Commorragh was the rule, not the exception. Zaknyrr let his gaze drift over their faces. To an untrained eye it would be construed that every enslaved creature was wearing the same expression. That expression reflecting the natural condition a creature’s soul suffers after years of physical and psychological punishment. Stress, pain, paranoia, defeat, all fitting descriptions of their outward emotions. But Zaknyrr was cleaver enough to see behind that projected mask. Underneath, many of these men and women maintained their fighting spirit. It was there, like a spark at the corners of their eyes. The Kabal chose these individuals for a purpose, and it prided itself on choosing quality livestock. The Dracon conceded that this crop would make for good hunting. The chime sounded. Its bellow crashed like a gong and then finished with the scream of dying a lamb. The slaves had to be prodded into moving at first, but then quickly shifted and trampled into the Death World’s jungle like rabbits fleeing a forest fire. Zaknyrr, with a dripping corpse still hanging from the front of his Venom, finally locked eyes with the one who had originally unnerved him. On top her custom Raider, surrounded by her emerald caped Incubi, was Archon Syxal Isavuda. She could pass for a rattlesnake, with her cool black eyes set into coppery skin. Her menacing grin told the Dracon everything he needed to know. While the Kabal would soon be sent to hunt the just released prisoners, Archon Isavuda would instead be hunting Zaknyrr. A sport for black hearted Kings and Queens indeed. Character Sheet! Asterixes (*) are optional but preferred. Last edited by Bone2pick on Sun Jul 07, 2013 7:54 am, edited 1 time in total. Strengths: Rather tough and strong, still fairly quick on his feet. Biography: Jameson was born and raised on Catachan, are fairly tough going survivor born. and was indoctrinated in to the Catachan 4875th Regiment, where he served in the Demolition Teams where he put use to the quote "things make bigger explosions when you use more explosives", he was abducted as a late 20's lad after the rest of his squad was annihilated by Dark Eldar Raiders on a routine scouting mission. Since then he had been biding his time, waiting for the right moment to prove his skills in survival. Since his capture he's held on to his trusty Catachan knife and his lucky lighter that has never run out of prometheium. *Nickname: Yanko, or just pilot. *Religious Views: Has no faith for anything. *Political views: Doesn't believe in politics. Default attitude: Acts coldly, tends to not believe in anyone or anything. *Likes/Dislikes: Likes engines, ships and such. Hates the Imperium, dislikes Adeptus Mechanicus. *Quirks: Smokes Lho sticks when nervous, stares often into distance. *Intelligence: Knows how to fly a wide selection of imperial air- and spacecraft, and is an apt mechanic. Knows space travel. Fears: Emotional attachments, large bodies of water. Strengths: An excellent pilot, and has Imperial Navy training. Armour: Wears no armor, but has old imperial fatigues and a padded cap. Weapons: A lasgun with a folding stock. *Hair: Thin, long brown hair. *Distinguishing Features: Has a large nose. Biography: Petkor Yankovitch was a rising star in the Imperial Navy in his twenties. Everything his tutors asked him to do, he excelled at. As such, as soon as he had graduated, he was sent to front lines of war as a pilot. Flying various military aircraft in strategic raids, he soon became accustomed to the atrocities of war. A decade later, he disappears from Imperial Records, last markings being warnings of a psychological meltdown, noticed by his commanding officer. The cause of these instabilities is nowhere to be found, and seemingly all traces of his life outside the military are wiped. Lieutenant Yankovitch ceased to exist in the eyes of the Imperium. Two years after the events of Zerocide, Petkor Yankovitch finds himself in a cargo ship pummeling towards the extremely hostile ground of Shauth in the Athaca system at lethal velocity. *Political views: One holds power by whatever means necessary. One loses their power by being unfit to wield it. Armour: Custom Kabalite Warrior segmented armor. Most of the suit is black with the exception being emerald green shoulder plates, many of the segments are tipped with razor sharp blades. *Distinguishing Features: He has two tattoos that define his look: the first being his lips, which are stained black in contrast to his ghostly pale skin; and the second is a spider web that wraps around the entirety of his slender throat. Biography: The young Dracon has served under several superiors throughout his tenure with the Kabal of the Cutting Web, and every single one of those (with exception to his current Archon) has been slain by Zaknyrr’s devices. He is a relentless opportunist, a devastating combination of ego, ambition, and will. His peers, when pressed and when given reason to honestly critique Zaknyrr, praise his hasty and sinister rise through the Kabal’s ranks; but warn against his garish and visible methods. He has been bold with his blade, but his lack of subtlety has drawn the eyes of those who have much to lose. Zaknyrr has taken his share fortune during his young life, and he has the enemies to prove it. I'm not sure if I can just join but, if I can, here goes. *Religious Views: An extremely faithful servant of the Emperor, though will occasionally be tempted by Tzeentch. *Quirks: He can be foolishly aggressive at times. He will often pray to the Emperor whenever he has a moment. *Intelligence: An excellent tactician and intelligent in most matters. Fears: Another run in with raw Warp Energy (see biography). Weaknesses: As stated above, he can be over aggressive at times and will sometimes go into uncontrollable and vivid recollections of the battle with the Daemon he had on Calth and terrible visions of the future. (see biography). Armour: All of his armor was taken by the Dark Eldar save the armor on his right arm from the elbow down. The Dark Eldar wished to have it serve as a painful reminder of what he used to be. Severus Everyn was a tactical marine of the Ultramarines Fourth Company under the command of Captian Uriel Ventris. He was to be the successor of his squad sergeant, Veteran Sergeant Pasanius and had a promising future as an Ultramarine. That all changed when the Iron Warriors and M'Kar the Daemon Prince invaded Calth. He was wounded in battle with a Daemon and lived. This did not sit well with the Chapter's Chaplains, despite his loyalty to the Emperor. Only one in allegiances with powers of the warp should have been able to survive a wound that severe. He was exiled from the Chapter, all his heraldry removed, and banished. He was discovered by the Kabal of the Cutting Web and taken into slavery. There, it was discovered that the wound did possess the energy of a daemon of Tzeentch within. The Dark Eldar would torture him into such emotional distress that the energies would increase to such levels that the energies could allow him to see the future. Each time though, he would be eaten away by Chaos, slowly rendering him harder and harder to be redeemed. Though he thinks he can be saved by proving himself a loyal servant of the Emperor on Shauth , it is only a matter of time before he falls to Chaos. Last edited by Carnifex160 on Sun Jul 07, 2013 7:55 am, edited 3 times in total. Fears: Allan's greatest fear is losing his friends. Believes he could talk his way out of encounters with inhabitants of the planet or his captors. Is good with animals but he can't as easily escape a situation with the jungle monsters so he would prefer to avoid them! Strengths: Expert in explosives and is good at talking his way out of things and convincing people to do what he wants. Good with animals. Knows how to make alcohol out of goat's milk. Weaknesses: Is not physically strong, finds it difficult to kill anything without very good reason. Last edited by easycompany on Mon Jul 08, 2013 5:43 pm, edited 2 times in total. Goal: He used to hate Chaos. Since the events of last year, his mind has been twisted and every day is a struggle to find out what his true motive in life is. Religious Views: The Emperor protects those who Protect him. (Note that it isn’t “For The Emprah!” because he isn’t sure if he’s devoted to him anymore. He simply acknowledges that the Emperor is almighty and powerful). Quirks: He likes to rip stuff up. Small things, like paper or wood. Intelligence: Knows a lot about the mark of Chaos, weaponry, and combat tecniques. Fears: Succumbing to the chaos side of him. Strengths: Punching, being a leader. Weapons: A chainsword given to him by a mischievous Kabal warrior. Hair: Perfect buzz, light brown color. Distinguishing Features: A huge gash down his left eye and cheek. He’s also missing a finger on his left hand. Biography: Rodomus was a very bold marine. From his very first mission against Orks, Rodomus was recognized as a fierce and powerful warrior. Promoted to Sergeant of a tactical squad, Rodomus led his battle-brothers into many perilous battles. As his squad were all but killed, side from him and Brother Colenias, his Captain realized this position was not suitable for him. Rodomus and Colenias were both placed in a Devastator Squad. The Devastator Squad was placed in Third Company and was part of five planetary assaults and twenty smaller missions. With the discovery of a Chaos cultist on planet Novus, Rodomus and his squad were one of the first to be sent onto the planet, in order to find the Chaos spawns and annihilate them as quickly as possible. On the planet, Rodomus, isolated from the rest of his troops, was captured and demons thrust words and thoughts into him. He resisted, and was rewarded, for a giant Land Raider ran over all the Demons and rescued him. He was accussed of being tainted with chaos, and he was about to find out if he was, until his vessel was ambushed by Dark Eldar, and everyone but him was killed. Sensing the internal struggle inside him, the Dark Eldar took him to the mysterious planet. Last edited by Crusherfex on Sun Jul 07, 2013 8:41 am, edited 1 time in total. *Goal: Another attempt at revenge for the betrayal and stranding of his Lady Archon by her son. *Political views: Its not his place to be political. Default attitude: Rarely speaks, preferring to glare a those to speak to him. The few words he does say are Laconic in nature. *Likes/Dislikes: Loves the scent of terror in his victims at the moment before death, Hates traitors and cowards. *Intelligence: Knows countless hand to hand combat styles and where to strike the prey for the quickest kill. Strengths: Excels at close quarter protection and close order combat. Armour: A battered and well used set of ghost plate armour whose shield generator has been moded ( see biography). It is sandy bone in colour missing its helmet and has no marks to identify his kabal save its colour. Weapons:Twin blades, 9 inches in length inlaid with pain amplifiers. *Possessions on Person: a cloak seemingly made of shadows woven into the night, it would be the perfect stealth tool if it was undamaged as it is, it only serve to keep him dry. *Hair: Grey/ white long and tied back with a short well maintained facial hair. *Eyes: Electrical blue Eldar augmentic replacements. Biography: Raised form a young age in one of the many Incubi temples in the reaches of Commorragh, Maakreth became quickly known or his almost unmatched skill in hand to hand combat his kind was famed for. Despite this many chose not to utilise his skills due to his single mindedness and lack of situational awareness once in combat. Eventually Lady Darimeth hired him into her newly formed Kabal of the silent sands, Using him as a lone wolf in a series of brutal and brilliant raids and assassination her cabal rose quickly to prominence in the Dark city. But, such with the fickle ways of that dangerous place it was not to last. On on raid Lady Darimeth lead her kabal into the field as was the norm, but on this occasion she had brought her son with her. Almost as soon as the the webway gate was closed upon their target the traitorous lordling betrayed her. He had turned all her Incubi bodyguards against her, all save Maakreth. Blind with rage he turned on his once brothers and slew them in quick succession but not before the lordling had given his mother a seemingly mortal wound. He then withdrew into the webway with the majority of the Kabals forces. Grievously wounded but not dead, Lady Darimeth called Maakreth to her side. There she stripped him of Incubus plate and weapons as punishment for his failingin his duty. paradoxicly she followed this by presenting him with three gifts. Firstly a battered and well used set of kabbalite armour, finished in matte black as opposed to the kabbals usual creamy bone white colour. Secondly was a matched pair of blades from her own belt, these were the colour of obsidian and were inlaid with all manner of pain enhancers. The final gift was less of a gift and more of a curse. It was a pendant made from wraithbone and a soul stone. It purpose was to sacrifice his soul to Slaanesh should he fail in the task she gave him. Darimeth then instructed Maakreth to return to the dark city track her son down her son place a matched pendant to his around her sons neck and kill him and any of the traitorous commanders who followed him. This done he should return here with any remaining forces of the kabal and collect the stranded survivors. Last edited by Jaman on Mon Jul 08, 2013 10:40 pm, edited 1 time in total. *Goal: Once Gelyn wished to see the galaxy before Arach-Qin's departure. Now he only desires to see those crystal domes once more. *Religious Views: The old gods died millennia ago, all but Slaanesh. There are no saviors to pray to. *Political views: Gelyn submits to the will of the seers. "We trust in their guidance." Default attitude: Curiosity towards everything. Since his capture, however, he's become more reclusive. *Likes: Learning new things and seeing new places. *Quirks: Likes to twirl his birthrune charm, and sometimes slips into dreams. *Intelligence: Gelyn has completed the Path of Awakening and the Path of the Dreamer. He feels in touch with both his emotions and the emotions of others. He also knows a bit about Low and High Gothic, as well as handling the tame rams of his Craftworld. Fears: Eternal desecration in the claws of She-Who-Thirsts. Armor/Clothing: Scuffed black robes with beige trim. Weapons: None of course. Gelyn could unleash an uncontrolled psychic blast, yet he fears the repercussions. *Possessions on Person: No spirit stone, no birthrune, nothing. His captors took them all away. *Hair: Shaved. Now, though, he's slowly growing back a fuzz of black hair. *Eyes: Thin lime green eyes. *Distinguishing Features: Gelyancen's birthrune is also inscribed under his left eye, in a faint permanent red. Thought for the day: A mind without purpose will wander in dark places. Inquisitor's note: Little concrete information is known about this Craftworld. All knowledge originates from interrogation of an Eldar Ranger (See: Interrogation Log E03784), who died in the middle of the process. Given the lack of presence of any other Eldar from this Craftworld, one can surmise that they are cowards and no further inquiry is necessary. I have completed the Path of the Dreamer. And yet, I feel no more content for it. I can sleep no longer. My dreams are filled with visions of what may lie outside this wraithbone world-vessel. What may be on those worlds other than this one? How will I rid myself of these repeated distractions? And what do these visions indicate about me? I will speak with the Dream-Teacher about this. -Thoughts from Gelyancen Kileath, 12 cycles ago. I am resolved. I must see the worlds without, before the closing of Arach-Qin's webway ports. What will they look like, I wonder? Will they be crude like the structures of the fabled Imperium, elegant like our spiraling spires, desolate like the corona of a star or tame like the rams which wander under our wraithbone trees? I appear not to be the only individual with this wish. I heard of a Mariner, Aleanith, who may join me on this exploration. All we need, then, is a transport. -Thoughts from Gelyancen Kileath, 10 cycles ago. We are prepared. Aleanith somehow secured the use of a Shadowhunter, by means I feel I should not question. Will they peruse us? I hope they do forgive us once we return. Very well. I shall delay this no longer. I do this so we shall leave the galaxy with no regrets. Gelyancen sensed the approach of his wardens. He felt their empty souls salivating for his mind, yet he paid them no heed. He heard something click open, and a pulse of blatant malice as something landed on the agony-stained cold ground. Gelyn didn't budge. They left just as quickly, their minds disappointed and their hunger directed towards another meal. The object remained. It filled the room with Aleanith's death pains, echos of when a pair of Grotesques ripped her apart. It carried a hollow reminder of one of her light laughs they once shared over a drink. It was her lung. Part of him wanted to taste it. They did this every several hours, letting each piece accumulate as a mound of wretched, ruined flesh. It tore at his spirit to sense her like this, when only cycles ago she smiled over the moons of Esthuel. Yet he had no choice but to endure the pain, to remember who she used to be, to suppress his gnawing hunger. His captors said nothing and gave nothing else, evidently waiting for when Gelyn would give in and become a beast like them. He wouldn't do that, no matter how weak his limbs became or how painful each breath echoed through his chest. He wouldn't Fall like his long-lost brethren. He wouldn't desecrate her like that. Gelyn lay on his back with his eyes closed. He shut out the aged screams in the walls and the beating of another prisoner one wall over; instead he focused on a wraithbone rune of his name. He twirled it and spun it through his mind, focusing on its edges and the perfectly curved strokes. He separated himself from the den of agonies and the failings of his body, and hid in the furthest reaches of his mind. There he stayed, waiting for anything. What kind of excuse is that…? And that is his weakness. “THAT IS ENOUGH!” bellowed Severus Everyn. The slave beside him in the tree had completely lost interest in fighting off the trio of Slaughter Swines below. His attention had been completely diverted to the Angel of Death gripping his head tightly and muttering to himself. Severus looked back at the slave. He noticed his combat blade had been unsheathed and saw the thrill of fear flickering behind the poor man’s eyes as he realized that in his trance, he must have attempted to bring his blade to bear upon the man. Severus had experienced such dreams where he spoke with the voice within him, but never had the voice convinced him to take action in the material world before. He looked down at the blade, then back at the man. “I… I’m sorry,” muttered Severus remorsefully. The man’s fear quickly turned to a scowl. The slave leaned in close to the Space Marine. Their eyes met. “I hate you,” he whispered and jumped from the tree into the woods below. The man would not survive, Severus knew it, and it would be his fault. He was emaciated and tired and wouldn’t have even made it up into the canopy without the Astarte’s help. He pushed the thought of what must be going on below from his mind and said a small prayer to the Emperor for the soul of the slave. They stood in silence, each one like a bird of prey, ready to swoop down into the jungle and tear the flesh from their victims bones. Soon they would be unleashed. Zaknyrr bit into his lip while he watched the opening ceremony. Only one moved among them, Yalek Hierarch, the right hand of Archon Syxal Isavuda. The other present members of the Kabal, including the Archon herself, were as motionless as cut obsidian. The wind whispered as it agitated the tall grass of the clearing. It had brought the scent of the jungle with it. Blood began to pool at the corner of Zaknyrr’s mouth. Yalek carried a relic with him as he skulked into the center of the loose circle of bodies the kabal had gathered into. Once his destination was reached he sunk onto both knees, and with the same care a mother gives her new born babe, he placed the artifact on the ground before him. A single deathly white hand pulled the black satin veil off of its subject. An upright humanoid statue, as high as an Elderith’s knee and devoid of all features, was the familiar sight before them. What was visible of its exposed body dazzled like polished chrome, and overtop its metallic flesh were countless jade strands. Each strand helped form a cocooning web, an emerald prison that would forever bind its faceless captive. Once again the wind stirred, this time it tingled with electricity. Yalek Hierarch remained in full bow as the Archon finally broke her frozen stance amid her protective Incubi and advanced toward the artifact. Her strides were long and measured, a movement not unlike the stalking approach of an arachnid. She was graceful, even in her full Ghostplate. She was threatening, even without a victim. Her silver hair cascaded over her shoulder plates, and a choking hand was tattooed and displayed over her slender throat. Her parade finally ended in front of the figurine, and she lowed herself into a single knee bow before it. Ever so gently, she leaned her brow onto the statue. At that precise moment, the Kabal began to see with one eye. It began to hear with one ear, taste with one tongue, and feel with one skin. Their outer world dissolved around them as their minds were married. That’s when Syxal Isavuda, Archon of the Kabal of the Cutting Web, began to speak to her subjects. Not just with mere words, but with images, sensations, emotions, and memories. They saw themselves back in their dark palace on Commorragh. As one they raced through its shadowed hallways and swept through several cruel torture chambers. A black tapestry with an emerald spider web sprawled across its length, the symbol of the Kabal, was then brought into view. Then they were thrust deep into the jungles of Shauth. Reliving vivid memories from previous hunts which made their hearts accelerate. They could feel the hot sticky air of the planet, and they could taste the sweat on their lips. The image of a bloody hand tearing off a fresh corpse’s jawbone repeats itself. They are shown their future enemies. A warrior of the mon’keigh appears, a male from a jungle world of his own. He fades into the wild bush and is replaced by an oversized creature of the same species. This new enemy is thickly muscled and wears a scar that runs the length of his face. A fist of the mon’keigh’s Emperor manifests itself beside the brute and then blows away along with the warrior as if made of smoke. They are shown one in their likeness, an Eldarith gliding through the underbrush with augmented optics that occasionally catch the light. He too fades from view, and is replaced by one of their misguided kin; an Eldarith whose ancestors chose a foolish path to follow. They watch with hateful eyes as he bends down to test a puddle of water. A crimson rune, obscenely marked under an eye, is reflected into the pool. The wind comes once more and blows the image away. Memories from past hunts replay. They watch Venoms speed over an enormous fallen tree trunk that serves as a makeshift bridge over a raging river. The scene changes as slaves hopelessly climb trees in an effort to flee, while their Kabal hunters effortlessly scale up after them. Down come the bodies. Mon’keigh corpses fall from the jungle’s canopy like rain drops. They are back. Gathered in the clearing, one hundred and thirty of the Kabal’s finest warriors are standing. Archon Isavuda has disconnected from the Spider Stone, and the link has been severed. The Archon, along with Yalek Hierarch, rise and turn their attention to the awaiting hunters. A subtle nod was given by the Archon and Yalek delivers the signal to dismiss the collected Kabal. Yalek’s trivial gesture, by the approval of Archon Syxal Isavuda, had just officially commenced Firnin’Ryl. Zaknyrr was one of the last to stir. Most of the others had begun their journey into their hunting grounds, the wild jungle of the Death World Shauth. The Dracon could still taste the iron in his mouth from his bloody lip. His nervous biting habit was unsurprisingly in full bloom. Finally he managed to snap out of his trance and turned to face his chariot. He hadn’t made the first step before he heard her voice. This time it was real and audible, not like the psychic manifestation he had just heard. He never turned to face his Archon. He simply broke stride, nodded in agreement, and finally smiled his black lips across his face before replying. The planet throb with life and ambience. Screeches and wails from unknown creatures vibrated through the tree bark and rebounded off the leaves, making Them impossible to detect, and even more so impossible to track. "So, uh, what do we -hmm- d-do?" Rodomus grabbed a vine and thrust it down to clear the path. Behind him were a couple Guardsmen, armed with nothing but the flak armor their hunters were too lazy to remove, a couple smoke grenades, and a single las-pistol. Like lost puppies, they kept close to the bare abnormal human, nervously observing the perimeter, jolting at every nearby squeak or hiss. "We survive, Guardsmen," Rodomus replied, crushing a dead, hollow, tree branch with his foot. The first Guardsmen, Sergeant K. Fillmore's face whitened when he saw the cut up and bleeding heel of the Marine. The second Guardsmen, Trooper Michel Sola carried in each hand a grenade, primed and ready to toss if anything were to happen. The trio marched in silence, the Marine's powerful feet muffled by the ambience of their surroundings. They clearly had no idea where to go, yet the Marine would occasionally look up, check his bearings, and randomly switch directions. "Lord, do you know wh--"
An abrupt stop by the Marine caused Fillmore to walk into him and fall over, cutting his sentence off. The Marine was staring up unto the trees, at something the Guardsmen could not even notice the silhouette of. Fillmore got up and brushed himself off bearing squinting up at where the Marine was looking at. The Marines gaze slowly lowered down the tree until he looked directly ahead, as if he was watching something move down from it. His jaw tightened and his arm rested on the hilt of his chainsword. Rodomus stared for another moment, then abruptly changed direction again, going a bit faster than before. Petkor Yankovitch had woken up in less comfortable places. That is not to say this was a particularly comfortable place to wake up in. As he opened his eyes, he saw nothing. As he wiped off the blood covering his face, he noticed he still saw nothing but a faint blinking light of emergency light activation. As he reached to press it, he found himself in no small amount of pain, barely able to rise from the seat he woke up in. When the energy-saving red lights flickered and he saw heavy metal curtains blocking where once had evidently been windows and yellow fire-resisting foam covering the door behind the seat, he started remembering how he had ended up there. He was in a ship where everything had gone wrong. Going over the machinery of the cockpit, he quickly noted that all primary systems were offline, and only emergency systems remained functioning. After turning few switches, a faint graph appeared on a cracked monitor, indicating it was safe to breath outside. Petkor sighed. At least he could step outside without the use of a centuries old breathing mask. Other than that, he had no idea of what kind of world it was that he had so abruptly crashed. Never steal a ship from a rogue trader, he reminded himself. Not only will they want your head, their ships tend to be just above ork craft in reliability. This had been an imperial munitions carrier, centuries ago, and after abandoned of use, it had passed down from one shifty smuggler to another, and finally to the rogue trader Petkor had stolen it from. Each owner, save for Petkor, had done their share of modifications and fixes, but the hull of the ship was near it's limit, and the modifications only added strain to it. Petkor thanked his luck the emergency systems worked, at least. Having the primary thruster fail above a system he lacked the star charts for hadn't left him with much optimism, but he had lived through the fall. He remembered smoking a lho stick during the fall, and was reaching for his pocket, but realized that it wasn't the best idea to start a fire, even that small, in a air tight enclosed cockpit he had no idea how long he had been unconscious in, and how long he would have to stay in it. If it even was air tight. With the kind of equipment he was dealing with, he couldn't know. After contemplating on the situation for a while, he decided to check the items at hand. Adding to his own rather limited burden of lasgun, a box of lho sticks, and a lighter, he found dry rations for a day or two, a first aid kit and a small blowtorch with an attached gas tank from a small closet in the cockpit. He tried his hand against the steel door. It was still warm. There was no firestorm raging behind it, but the flames hadn't completely died out, either. He forced it open. Rush of light blinded him, his eyes filled with the kind of light that can't be seen through the light-filtering cockpit windows. The crash landing had torn the ship asunder, an immense tear where the top of the ship had crumbled under it's own weight against the surface of the planet. Whatever the ship had been loaded with was now burning. On his right, the ships flank had ripped up against the bedrock, and on his left, the side had spliced on itself. Figuring there would be no proper route left intact, he started climbing up towards the breach in the hull several decks above him. As he reached the top and looked around himself, he felt despair. Far around him, the crash had burned down a clearing, but beyond that, he only saw jungle. He had fallen on a death world, and he couldn't see a way out. Actual Name: 7072680 - "Bruno Stihl"
*Goal: To die on his feet, fighting the enemies of the Emperor. The Krieg way. *Quirks: Blinks very slowly, or seemingly not at all to some. Whistles excite him. *Intelligence: Growing up on Krieg has given him many practical skills, as well as rigid habits. But more than anything, it taught him how to survive; and the longer he can survive means that he can do his part to repay Krieg's debt to the Imperium. Quick thinking and calculation give way to muscle memory in some cases. Fears: Being caged, unable to die, unable to fight. Strengths: Extremely tough and resilient, very skilled in hand-to-hand combat due to training, immovable and unshakable in the presence of an enemy. Weaknesses: Duty comes before tactical presence. Doesn't always pick the best route or option, but the one that will give him both outcomes: Killing his enemies or dying doing so. Armour: Krieg greatcoat and equipment, grenadier plate was removed. Gas mask retained. Weapons: A chipped combat knife the Krieggers use as their bayonets. *Possessions on Person: Gas mask, even though the respirator is not present. Collar tab of his regiment. *Hair: Formerly short, now shaggy brown. *Eyes: Flat, slate like blue. *Distinguishing Features: Scarred and marked skin covers his face and body over years of service as a Grenadier, one particular being one that encircles the 180 degrees of his throat. Biography: Grew up on Kreig lucky enough to be born the natural way the Emperor intended, not a tuber. Assigned into the training regiments he showed particular fearlessness in the face of danger, and was assigned to Grenadier training. He excelled in the high-risk operations of attack and defense easily, and was issued his gear and shipped off with the 33rd Infantry regiment of Krieg. Often attached to Siege regiments, Bruno has fought through trenches and kill-zones across many worlds. Fighting rebels, the threat of Chaos, the elusive Eldar and the brutal Green Menace. Artillery barrages have filled him full of shrapnel, las-bolts have pierced his skin, Orks have hewn at his body with crude weapons. He was always told that dying for Krieg was the duty of all her sons, but he wanted to maximize his potential; he wanted to live as long as he could so he could make his time alive worth it to the Emperor. During the defense of an agriworld, the 33rd Infantry regiment was sent to aid the PDF against an Ork horde. As they landed on the world, they had no time to set up the routine defenses, and were plunged deep in combat the moment they stepped of the transport. The Orks were expecting a slaughter, but what they got instead was the 33rd Grenadiers charging forward, silently, bayonets at the ready. The 45cm blades of their bayonets was more than enough to end the life of any lowly greenskin, and the horde was forced to retreat in the face of an immovable enemy. The entrenching began and the 6 year war began in earnest. The 33rd was slowly picked apart of the years, and when the threat of planetary takeover was gone, the Krieggers began hunting down the Orks; that is when the Dark Eldar scoured the granite hills of the Agriworld. His squad was all but annihilated, but they did not die without payment. They took as many as they could with them, but were caught by surprise and out-numbered by many. One of the warriors had jumped off of their skimming transports and knocked him flat from behind, stabbing him in the back Bruno tensed in pain, reaching around to try and grab his assailant. The Kabalite warrior grabbed him by the chin and lifted his mask skyward bending his head to see his face. The twisted helmet of the fallen Eldar greeted his eye lenses upside down as he felt a knife reach under and dig into his neck at the collarbone. The blade scraped and gouged its way across his throat, making him elicit a rare grunt of anger. He was not going to die like this, he had many more enemies to slay. He rolled over suddenly, catching the warrior off guard, his heavy grenadier plate pitting the warrior below him. He proceeded to tear the helmet off his attacker and began to pummel him with his fist, the other around his neck, strangling him. The salaciously grinning warrior's face now turned to fear as he stared back at the blank, stern face of the Kriegger, the sight slowly blurring as his eyelids swelled shut and a lack of oxygen deprived his brain. After long minutes passed, the broken and mashed face of the raider lay before the blood covered gloved fist that was raised in attack should he twitch or slow other signs of life. Bruno had been losing blood rapidly during the ordeal, and his self preservation kicked in; he found his lasgun and removed the power-cell. Connected both nodes to his knife, the energy within began to dissipate into the bayonet, heating it rapidly. He moved the metal to his bleeding neck, hesitating only for a slight second before he cauterized the wound. He raised himself to his feet as the world went black. Bruno now finds himself in the ownership of the dark fiends, routinely physically and mentally punished he never faltered. This was so unnerving to his owners that a mere man was so unmovable to the horrible fate he now lived that they forced him to wear his gasmask again, so they could escape his cold, hate-filled eyes that followed them. After being selected and herded onto transports, he and many other prisoners await an unknown fate. Maakreth left the clearing, heading into the tangled and murk dark of the surrounding jungles. His wake left a trail of corpses, each body showed little outward evidence of deadly trauma but all had been the recipient of expertly placed blows. All had died quickly, but as far as a sated Maakreth was concerned each body represented an unnecessary risk and a waste of time. He should not have killed them, the death world they had been stranded upon or the hunters loosed to chase them would have taken then soon enough. He could of used them as bait, still there was no point point thinking upon potabilities now. His motivation for killing was much easier to determine, the fist few had been out of anger. Anger at being captured, anger at failing his mission, anger at his own stupidity. Then the killing had turned to sport. That hadn't lasted long, most in his group were long held slaves. This naturally meant that despite them once being proud warriors many were weak with malnourishment. Killing them had almost been an act of mercy.The last few he had killed to feed his hunger, if he was to survive this place he would need to be as strong as possible. But that was the past, Maakreth pulled his thoughts into the present. He headed into the thick and humid undergrowth of the death world, his augmentic eyes automatically balanced his vision for the low light levels. It did not take long for him to come across a trail almost calved through the jungle. This main path, perhaps twice his width was shadowed by others, the hunted and the hunters he mused. The hunters path was harder to track but would potentially give him his best shot at getting of this rock.